Joey Logano dominated the First Data 500 at Martinsville Speedway. However, he had to use his bumper to get the NASCAR win at the end of the race. The race at Martinsville was pretty tame by Monster Energy NASCAR Cup Series standards. There were only eight caution periods during the race. Two of those came following the first two stages of the race. Denny Hamlin was able to capture the win in stage one while Joey Logano was the winner in stage two. Joey was the driver that led the most laps being out front for 309 of the 500 laps of the race. Five other drivers were able to lead the race when Joey wasn’t. Those six drivers exchanged the lead eleven times during the race. The two most talked about lead changes will be the one that happened on the final two laps of the race. Martin Truex Jr. was able to get to the bumper of Joey’s car with just a handful of laps remaining. Martin raced Joey hard, but cleanly trying to get around him for the lead. Martin was finally able to get to the lead as the two cars took the white flag signifying the last lap of the race. Martin raced off through the third turn with Joey right behind him. Going through the fourth and final turn Joey hit Martin’s car on the back bumper to get him loose for a chance to pass for the win. NASCAR fans and drivers call this the “bump and run.” The move got both cars a little out of shape, but Joey was able to keep enough control of his car to claim his first win in NASCAR’s top division at Martinsville Speedway. The win also automatically gives Joey a spot in the Championship Four at Homestead-Miami with a shot at winning the 2018 championship. Denny Hamlin drove under the two sliding cars to claim a second place finish while Martin Truex Jr. was able to control his car enough to slide across the finish line for third place. Kyle Busch took home the fourth place finish with Brad Keselowski claiming fifth place. 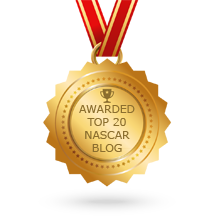 There are two more races in the Round of Eight before the four drivers that will have the chance to race for the 2018 Monster Energy NASCAR Cup Series Championship are set. Sunday afternoon’s win lock Joey into one of those spots as mentioned earlier. 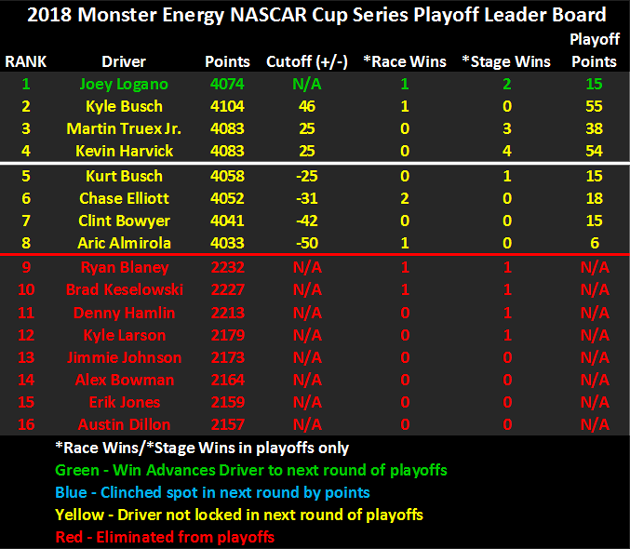 Below is a look at how the NASCAR Playoffs Leader Board looks following the race at Martinsville. While Joey’s move to win the race is completely acceptable in NASCAR there may be something else that he didn’t think about when making it. The drivers remember when they are raced cleanly and when they are not. The saying “What goes around comes around” is not only one the drivers repeat often, it is one that they play out even more often. In that final race of the season for the championship Joey should be very nervous if he looks in his mirror and sees Martin behind him … just saying. The NASCAR drivers and teams will go from the shortest track on the circuit to the high-speed track of Texas Motor Speedway this Sunday, November 4th for the AAA Texas 500.